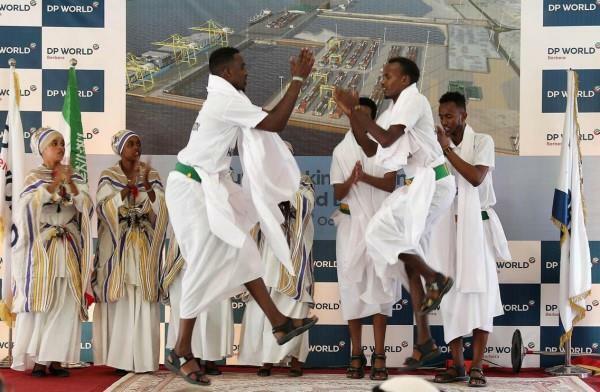 DP World has launched the first stage of its Berbera port expansion, designed to equip the Somaliland port for major vessels and transform it into one of Africa's pre-eminent facilities in the breakaway region. A ground breaking ceremony with Somaliland's vice president, Abdirahman Saylici and DP World executives took place in the small coastal town at the tip of the Horn of Africa on Wednesday. 'Our aim is to make this an important regional hub for the maritime industry in the Horn of Africa,' DP World Chairman and CEO, Sultan bin Sulayem said at the official signing on Thursday. Somaliland hopes the port expansion – which was first agreed in 2016 – will boost its economy by attracting other international investors, reduce unemployment and set it on the road to independence from Somalia. Somaliland, devoid of government support and international investment for decades, is one of the world's poorest regions. The move, however, has attracted the ire of the Somali government. In March, its parliament in Mogadishu declared the deal 'null and void', but Hargeisa was unmoved. 'Somalia cannot interfere in our affairs,' warned Musa Behi Abdi, President of Somaliland, on Wednesday night. The official contract signing on Thursday laid the groundwork for the first phase of the $101 million investment to expand the port yard by 250,000 square metres and modernise its facilities. Total investment of the two phases will reach $442m. The port's current capacity is around 150,000 twenty-foot equivalent units [a measure of ships container carrying capacity] and is set to expand to 450,000 TEUs once development is complete. DP World holds a 51 per cent stake in the Berbera port, while Ethiopia holds 19 per cent and Somaliland the rest. In recent years, DP world has stepped up its investments in Africa in order to capture the continent's growth potential. The port has traditionally relied on trans-shipment but the expansion will allow it to welcome major vessels, Adnan Al Abbar, a DP World senior vice president told The National at Wednesday's ceremony. 'The government has made its final decision. It is over,' Djibouti's ambassador to Somaliland Hussein Omar Kawleeye told The National on Thursday.